Update: Soon after publishing, I added more details on pricing, battery pricing, and comparisons to other coming models. Renault has apparently swooped in and beaten the long-hyped Chevy Bolt and Tesla Model 3 to market with a long-range, affordable electric car. Keeping that a secret must have taken some serious discipline! Granted, it isn’t a straight comparison, but it’s still a notable step forward by Renault. 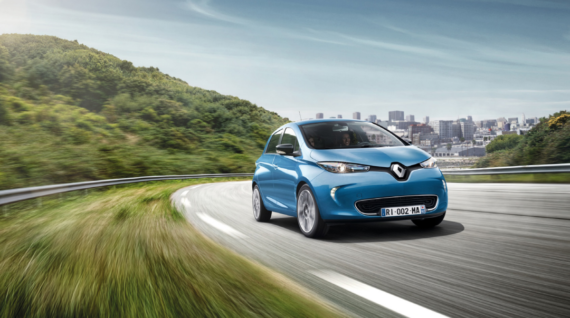 The new Renault ZOE, which can be ordered starting October 1, has an NEDC-rated range of 400 kilometers (~250 miles). The NEDC system is much more lenient than the EPA rating system, so this doesn’t mean the ZOE actually competes with the Chevy Bolt’s 238 miles of EPA-rated range or the Tesla Model 3’s eventual range (which is supposed to be no lower than 215 miles), but it still makes the new ZOE the first long-range all-electric car with an affordable price tag, which is a hefty accomplishment! Carlos Ghosn must be smiling right now. The “real-world” range of the new ZOE is 300 km (186 miles), according to Renault — it’s quite nice that Renault actually provided such a number, especially when the NEDC rating system is so inadequate and also quite variable (there’s no straight conversion to the EPA or a real-world rating). As you may have noticed, Renault doesn’t roll the dice in the United States, which means that the Bolt is still presumably going to be the first long-range all-electric car with an affordable price tag on the US market. Customers who make it to the Paris Motor Show, where the new Renault ZOE and a new all-electric concept car are being unveiled, can actually order the new ZOE right there. Naturally, despite having similar range and pricing to the Chevy Bolt (Opel Ampera-e) and Tesla Model 3, there are many differences as well. The Model 3 still looks leagues ahead of any of the others in terms of styling, performance, and tech, but the Bolt has a couple of advantages of its own (the rear-view mirror looks sweet and the hatchback design will make many people happy), but the ZOE is a car I enjoyed very much when I drove it, and I’ve heard from many happy ZOE owners/lessees. Pricing isn’t a simple affair either. The car has a variety of trims/prices, but the battery is leased. You can lease the battery and the car together starting at €149/month. The new ZOE also comes in two new colors (“Intense Red” and “Titanium Grey”), with the long-range ZOE being dubbed the INTENS ZOE. 2 charging cables (flexi-charger for domestic sockets and a cable for Wall-boxes and public recharge points). Renault still offers lower-range ZOEs — for a lower price, of course. These are dubbed the LIFE and ZEN (LIFE+). The INTENS, by the way, us also referred to as the ZEN+. The new Renault Zoe will have a 400 km NEDC range, but it won’t be called R400 as I expected. Renault decided to have two different names. The Zoe R90 (Range version) doesn’t quick charge capability, while the Zoe Q90 (Quick) does. The R90 versions with the 41 kWh battery have a 400 km NEDC range, while the Q90 versions with the same battery only have 370 km NEDC. I still don’t know why the 90 figure is in the name, maybe it’s because of the 88 horsepower?! Note: Pedro shared prices for the ZOE with battery included — approximately €8,000 more for each model if you buy the battery — but such an option is not in the initial press release from Renault and the press release he referenced is not long online. What are your thoughts on this stunning announcement from Renault?